A thermodynamic cycle for the conversion of heat into work, consisting of two isentropic phases interspersed between two constant-volume phases. Also known as spark-ignition combustion cycle. The basic thermodynamic cycle for the prevalent automotive type of internal combustion engine. The engine uses a volatile liquid fuel (gasoline) or a gaseous fuel to carry out the theoretic cycle shown in the illustration. The cycle consists of two isentropic (reversible adiabatic) phases interspersed between two constant-volume phases. The theoretic cycle should not be confused with the actual engine built for such service as automobiles, motor boats, aircraft, lawn mowers, and other small self-contained power plants. The thermodynamic working fluid in the cycle is subjected to isentropic compression, phase 1–2; constant-volume heat addition, phase 2–3; isentropic expansion, phase 3–4; and constant-volume heat rejection (cooling), phase 4–1. Piston descends, inlet valve opens. Air drawn in at constant pressure (Line 1–2). Piston ascends, both valves closed. 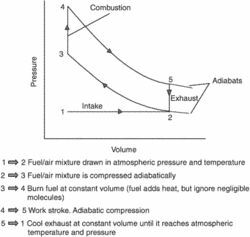 Pressure increases and volume decreases to point 3, combustion at constant volume results in sharp pressure rise to point 4. Increased pressure at constant volume forces piston down, resulting in increases in volume and drop in pressure (Line 4–5). Exhaust valve opens, releasing combustion charge with rapid drop in pressure at constant volume (Line 5–2). Piston rises and forces remaining gases out of exhaust at constant pressure (Line 2–1). Cycle begins again at point 1. A thermodynamic cycle for the conversion of heat into work, consisting of two isentropic phases interspersed between two constant-volume phases. It is the four-stroke cycle of operation that produces the power within the cylinders of an internal combustion engine. The cycle is named after Dr Nicolas Otto, who introduced it in 1876. The process of conversion from diesel to Otto cycle consists of replacing the entire diesel injection system with a gas carburetion system to the intake air and also an electrical system with spark plugs for ignition, which occur by electric spark. This study consists in the experimental evaluation of an air blower actuated by a 2-S internal combustion engine with Otto cycle, regarding fuel consumption (kg h-1), operating with different gasoline/ethanol blends and angular speeds of rotation of the engine/rotor shaft (RPM). Objective: The Anyoon Rotary Engine is a concept engine that incorporates a unidirectional rotary design and obeys the Otto cycle to perfection. The Scuderi split-cycle engine changes the heart of the conventional engine by dividing (or splitting) the four strokes of the Otto cycle over a paired combination of one compression cylinder and one power cylinder. The RX 450h brings the sixth-generation of the Synergy Hybrid System and with it, the first application of the Atkinson Cycle instead of the Otto Cycle in the SUV. Manning up the Lexus RX 350: how do you solve "a problem" like the Lexus RX? The dominant car-engine combustion process of the last century, the Otto cycle, is spawning variants--and, in some instances, entirely new ignition schemes. Furthermore, current gas-operated engines are based on the same technology as gasoline engines, the Otto cycle, which is not as energy-efficient as diesel-engine technology. For the first time in a Lexus performance engine, the RC F uses the Atkinson cycle at cruising speeds for enhanced fuel economy and then switches to the Otto cycle at higher rpm to develop impressive performance levels. The Scuderi Split-Cycle Engine changes the heart of the conventional engine by dividing the four strokes of the Otto cycle over a paired combination of one compression cylinder and one power cylinder. Westport and Isuzu collaborated on technology development from 2001 to 2004 with two primary objectives: first, to improve thermal efficiency by 25% or more over the Otto cycle, and second, to achieve at least 75% lower emissions than the current ultra-low-emission vehicles. This is commonly the case in engines using the Otto cycle. The Otto cycle engine came to dominate and everyone forgot about James Atkinson.